Despite going 8-2 in their last 10, the Islanders are middle of the pack on the Stanley Cup oddsboard. New York plays the Blackhawks on Tuesday, when the teams' opposite over/under trends collide. Despite the Islanders (29-15-4) winning five straight games and going [8-2 in their last 10](http://www.espn.com/nhl/standings), 11 teams still have shorter odds than the Metropolitan Division leaders to win the 2018-19 Stanley Cup, according to Monday's numbers at the Westgate Las Vegas SuperBook. ## 2018-19 NHL Stanley Cup odds update The Blackhawks (17-24-9), who are tied for the fewest points in the league with the Devils, Red Wings and Senators (43), host the Islanders (30/1 odds to win the Cup) at 7:30 p.m. CT Tuesday. Chicago is a +125 underdog and -220 on the 1.5-puck line at the Westgate. The Isles, who won in Chicago 3-2 in overtime on Jan. 3, are -135 ML, +190 -1.5 goals and the total is 6.5 (under -120). The Blackhawks won the Stanley Cup in 2010, '13 and '15, but their 500/1 futures odds are tied with Ottawa and Detroit for the longest in the league. 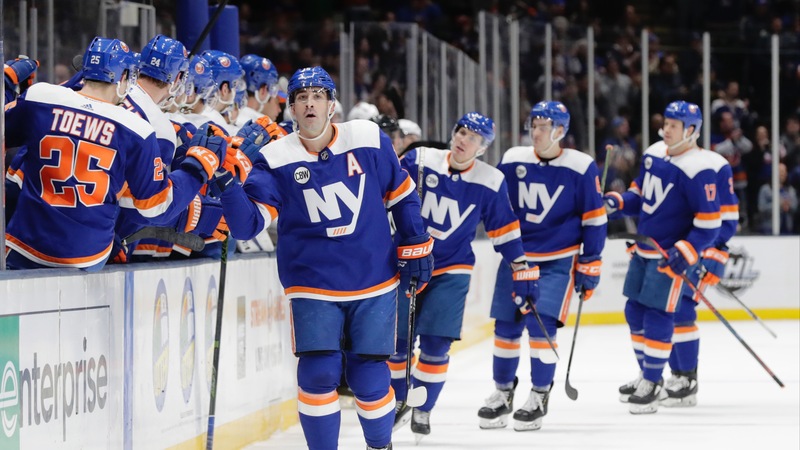 New York, which [lost its best player (John Tavares) this offseason](https://www.betchicago.com/john-tavares-maple-leafs-stanley-cup-odds) to the Maple Leafs, is trying to win its first Stanley Cup since the last of four straight titles in 1983. The Islanders' five-game winning streak is the longest in the league ahead of Tuesday's action, and eight wins in their last 10 is better than everyone save Calgary (8-1-1). They've won 15 of 18 since Dec. 15 under the guidance of new head coach Barry Trotz, who won the Cup with the Capitals last season. New York hasn't allowed a goal in its last two games, or more than one since a 2-1 loss to the Rangers on Jan. 12. The Islanders beat the Ducks, 3-0, on Sunday, and have two more points than Tavares and Toronto as of Tuesday. The Isles' stout defense conflicts with the Blackhawks' trend of seven straight OVERs. On the season, Chicago is 29-17 to the OVER, and a ridiculous 40-10 to the first period OVER. New York is 29-16 to the UNDER, but 26-22 to the 1P OVER. __MORE:__ [Vegas futures](https://www.betchicago.com/las-vegas-golden-knights-futures-odds-pacific) | [Blackhawks-Rangers bad beat](https://www.betchicago.com/nhl-bad-beat-blackhawks-ruin-rangers-puck-line-bettors) <a href="https://www.youtube.com/watch?v=ziRSt5Avlpw" class="embedly-card" data-card-width="100%" data-card-controls="0">Embedded content: https://www.youtube.com/watch?v=ziRSt5Avlpw</a> Though they lead the Metropolitan Division, the Islanders are still 14 points behind the East-leading Lightning, who are the 9/2 favorites to win the Cup. The Flames (69), Jets (64) and Sharks (63) have more points in the West, while the Golden Knights and Predators have 62. But New York has games in hand on all of those teams except Winnipeg. Despite the Islanders' recent hot streak, their Cup odds have actually lengthened at some books ([25/1 to 33/1](https://www.betchicago.com/stanley-cup-best-odds-sportsbooks-january-lightning) on BetOnline.ag [as of Monday night](https://www.betonline.ag/sportsbook/futures-and-props/nhl-futures)). __Here are each team's Cup odds at the Westgate...__ Lightning 9/2 Golden Knights 8/1 Predators 8/1 Jets 8/1 Flames 8/1 Penguins 10/1 Maple Leafs 10/1 Bruins 12/1 Capitals 12/1 Sharks 12/1 Blue Jackets 16/1 Stars 30/1 Islanders 30/1 Canadiens 40/1 Avalanche 50/1 Sabres 60/1 Ducks 80/1 Wild 80/1 Hurricanes 80/1 Canucks 80/1 Coyotes 80/1 Oilers 100/1 Panthers 100/1 Blues 100/1 Flyers 200/1 Kings 300/1 Devils 300/1 Rangers 300/1 Blackhawks 500/1 Senators 500/1 Red Wings 500/1 __PLAY:__ Our free [Chicago NHL Puck Drop contest](https://betchicago.chalkline.com/games/chicago-nhl-puck-drop). Correctly pick the exact score of Tuesday's Islanders-Blackhawks game to win a BetChicago prize pack.